Each daylily bloom lasts a single day. 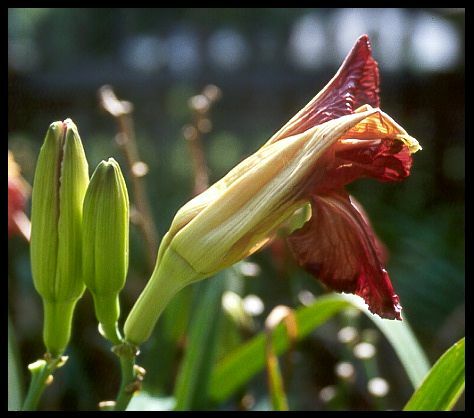 The day after a bloom has been open it will have withered and melted into a condition referred to as a spent bloom. This process is known as senescence. Most daylilies will slough off these spent blooms in 2-3 days by themselves, but gardeners may also elect to deadhead their plants to remove the spent blooms. This practice makes the garden neater and also helps prevent the formation of seed pods that are not wanted. After only a single day of bloom, the senescence process causes each bloom to start to break down and eventually dry up and fall away from the scape unless spent blooms are deadheaded.